XLVII:01 Those who reject Allah and hinder men from the Path of Allah, - their deeds will Allah bring to naught. XLVII:16 And among them are men who listen to thee, till when they go out from thee, they say to those who have received Knowledge, “What is it he said just then?” Such are men whose hearts Allah has sealed, and who follow their own lusts. XLVII:17 But to those who receive guidance, He increases their Guidance, and bestows on them their Piety and Restraint from evil. To only listen or read the words of the prophet and not understand them is an exercise in futility. The verses of the Qur’an are given to mankind to increase knowledge, understanding and wisdom, and to give Guidance. It therefore becomes necessary to understand the meanings, and not just read or listen to the verses. Only in this way can we truly receive guidance, understanding, knowledge and wisdom pertaining to the things that the Lord would have us do and his Signs. Verse 16 makes it perfectly clear that those who listen to the words, but who are not prepared, will not understand them. The words will not stay with them. This is not unlike the reason that Christ taught in parables. The words can be understood at different meanings on different levels according to the understanding and wisdom of the person listening to the teachings. It is the same for all scripture and all Signs. XLVII:21 Were it to obey and say what is just, and when a matter is resolved on, it were best for them if they were true to Allah. As with many verses which mention the Lord sending down another Sura other than that which the people receive in the Qur’an, verse 21 must be read in context. 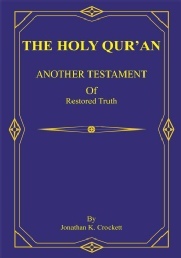 Although many could argue in the various instances that the verses of other Suras are referring to Muhammad receiving yet another Sura to add to the Qur’an, in context most of the verses are challenges for others to bring forth other Books equal to that of the Qur’an or the verses direct questions as to when the other scriptures, of which the Qur’an prophesies, are to come forth. However, verse 21 is different. It is a question put forth by the believers for whom Muhammad is receiving the revelations and having them written down. “Those hwo believe say, “why is not a sura sent down for us?” They are referring to a Book distinct from those htings being given to Muhammad, in that those thing Muhammad wrote was for them. Muhammad is told: “But when a Sura of decisive meaning is revealed, and fighting is mentioned therein, thou wilt see those in whose hearts is a disease looking at thee with a look of one in swoon at the approach of death.” When the Book does come down to them it will be a Book of decisive meaning, clarifying the meanings of things they did not understand. It will have “fighting. . . mentioned therein.” One could say that the many Suras of the Qur’an have fighting mentioned in them. This is true and therefore confirms that the Qur’an is not the Book referred to here, because the previous revelations given in the Qur’an, concerning fighting, would not be a surprise to the believers who had already heard or read them. The Book of Mormon, on the other hand, relates all of the wars and contentions of its peoples. 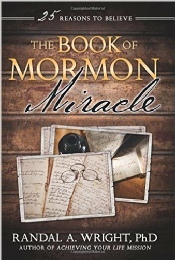 The Book of Mormon would, indeed, be a surprise to the Believers and followers of Muhammad. The revelations given in the Book of Mormon and the fact that another Book/Sura comes to them would cause the followers of Islam to have the “look of one in swoon at the approach of death.” The unbelievers in whose hearts there is a disease could not accept it without accepting that a restoration was necessary. They would have to accept the new Book, another prophet, the other people and the restoration as prophesied in the Qur’an, and they will not believe in it. “But more fitting for them – Were it to obey and say what is just, and when a matter is resolved on, it were best for them if they were true to Allah.” It is truly more fitting to obey and accept the revelations Allah/God has sent and say what is just about them once the matter is resolved, once the Book comes to them. The believers will accept it. XLVII:22 Then, it is to be expected of you, if ye were put in authority, that ye will do mischief in the land, and break your ties of kith and kin? XLVII:23 Such are the men whom Allah has cursed, for He has made them deaf and blinded their sight. 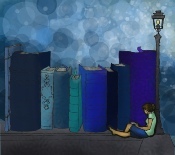 XLVII:24 Do they not then earnestly seek to understand the Qur’an or is that there are locks upon their hearts. XLVII:25 Those who turn back as apostates after Guidance was clearly shown to them – Satan has instigated them and buoyed them up with false hopes. XLVII:26 This, because they said to those who hate what Allah has revealed, “We will obey you in part of this matter;” but Allah knows their inner secrets. Those who do not accept the other Book/Sura and who do not accept all of the Revelations in the Qur’an will, “if. . . put in authority,” “do mischief in the land. . . Such are the Men whom Allah has cursed, for He has made them Deaf and blinded in their sight. “They” do not “earnestly seek to understand the Qur’an” or there are locks upon their hearts. If they turn back from the teachings of the Qur’an and the guidance it brings, then they are apostate. “This, because they said to those who hate what Allah has revealed, “We will obey you in part of this matter. . . “ They only accept parts of what is revealed. They do not believe nor accept all that is revealed. XLVII:29 Or do those in whose hearts is a disease, think that Allah will not bring to light all their rancor? XLVII:30 Had We so willed, We could have shown them up to thee, and thou shouldst have known them by their marks; but surely thou wilt know them by the tone of their speech! And Allah knows all that ye do. XLVII:31 And We shall try you until We test those among you who strive their utmost and persevere in patience; and We shall try your reported mettle. XLVII:32 Those who disbelieve, hinder men from the Path of Allah, and resist the Messenger, after Guidance has been clearly shown to them, will not harm Allah in the least, but He will make their deeds of no effect. XLVII:33 O ye who believe! Obey Allah, and obey the Messenger, and make not vain your deeds! “Those in whole hearts is a disease” refers to verses 20-22 which shows that there would be among the Believers those in whole hearts is a disease, those who would not accept all of the revelations, who, if put into authority, would cause mischief. If a person of authority teaches war, hatred and vengeance and not persistence in faith, forgiveness, tolerance, then that person does not teach nor believe in all that was revealed to Muhammad. If a person of authority does not believe in Jesus Christ, other prophets, other scriptures, another people, and a restoration, then he does not believe the whole of the Qur’an. It is important for those who believe to obey Allah/God and obey the Messenger and what he has revealed, otherwise their deeds are in vain. XLVII:38 Behold, ye are those invited to spend of your substance in the Way of Allah; but among you are some that are niggardly. But any who are niggardly are so at the expense of their own souls. But Allah is free of all wants, and it is ye that are needy. If ye turn back from the Path, He will substitute in your stead another people, then they would not be like you! After relating the previous apostasies and destruction of people who had gone before in verses 10 and 13 as one Sign, and noting the importance of having a prophet to reveal and restore truth, the prophecies and teachings of another Book are set forth to the believers as another Sign. In the same verses, the people are warned of those to whom is granted authority over them who would not be True Believers, and would not accept all that Muhammad revealed, showing forth the beginning of apostasy among the believers of Islam. Several keys are given, being: that those people would not accept all of the teachings, they would be rancorous and reject the Book which was to come. Lastly, in verse 38, the warning is given again that once they turned back from the path, the Lord would substitute in their stead another people. This in and of itself, alludes to the calling of another prophet to lead, guide, and restore lost Truths. Dr. Wright presents a handful of the many moving speeches in the Book of Mormon, comparing them with great speeches of our day, which have moved people to action and belief. From Nephi’s “Believe in Christ” to Mormon’s “The Way to Judge,” the Book of Mormon discourses changed the lives of people then, and affect all who read and believe and follow those words today.